The Back Story on our new logo. Last summer as I was working with a group of 10 participants to develop My Busy Healthy Life, our 4-Month Biblically Based Health Revolution Program I did a session on how to create a sustainable healthy lifestyle. As I prayed about how to approach this important subject of making changes that stick…not just an event…I started thinking about the many “foodie labels” people take on…Omnivore, Vegan, Vegetarian, Paleo, Raw Foodist, Juicer, Fruitarian, Atkins, South Beach, Organ-ik, and the list goes on. Everyone of these “plans” has some form where people can really go “out of balance.” I began to research the roots of these different “foodie labels” and found many have roots in eastern religious philosophy. Of course, that took me straight to God’s word because for me it is the final authority. God led me to a passage in 1 Timothy 4 that talks about how food will be viewed in the “last days”. This scripture passage instructs us to eat everything “God Made” with thanksgiving and it goes on to say “Nourish Yourself” in the Word of God. That’s it I thought…we just need to focus on NOURISHING OURSELVES with God-Made Food, the Word of God, Prayer and Godly Fellowship. This has really settled into my heart. I want to start a new movement…when people ask “are you (Foodie Label)” you and I can simply answer….”I Am Nourished”. Yes…we nourish our body because our body fuels our soul, which is our mind, will and emotion. 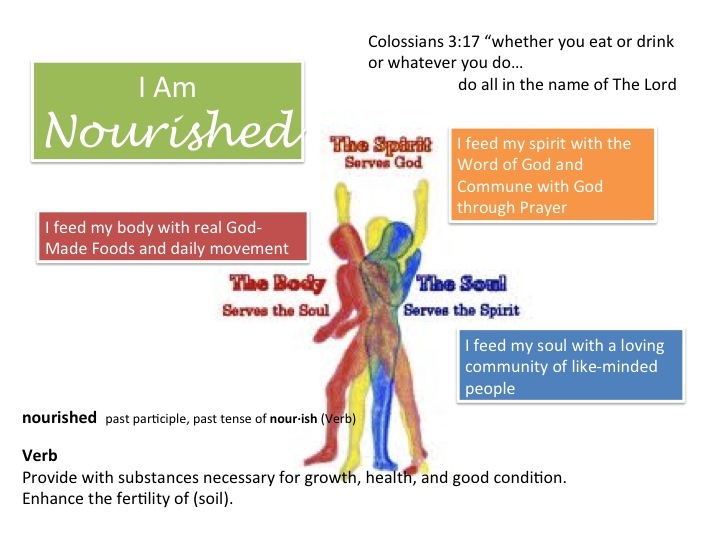 We nourish our soul because our soul fuels our Spirit, the part of us that connects deeply with God. We nourish our spirit because our spirit keeps us connected to God and His blessings.